TONERS There are 22 products. Compatible black laser toner cartridge for HP printers, yield: 6,000 pages at 5% coverage, Supreme version. Compatible black laser toner cartridge for HP printers, yield: 3,200 pages at 5% coverage, Supreme version. Compatible black laser toner cartridge for HP printers, yield: 4,400 pages at 5% coverage, Supreme version. Compatible black laser toner cartridge for HP printers, yield: 2,600 pages at 5% coverage, Supreme version. Compatible black laser toner cartridge for HP printers, yield: 3,500 pages at 5% coverage, Supreme version. 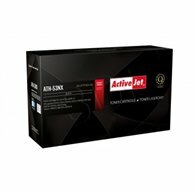 Compatible black laser toner cartridge for HP printers, yield: 7,900 pages at 5% coverage, Supreme version. Compatible magenta laser toner cartridge for HP printers, yield: 1,300 pages at 5 % coverage, Supreme version. Compatible yellow laser toner cartridge for HP printers, yield: 1,300 pages at 5 % coverage, Supreme version. Compatible cyan laser toner cartridge for HP printers, yield: 1,300 pages at 5 % coverage, Supreme version. 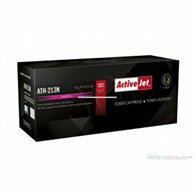 Compatible black laser toner cartridge for HP printers, yield: 2,000 pages at 5 % coverage, Supreme version. Compatible black laser toner cartridge for HP printers, yield: 1,500 pages at 5% coverage, Premium version. Compatible black laser toner cartridge for HP printers, yield: 7,500 pages at 5% coverage, Supreme version. Compatible black laser toner cartridge for HP printers, yield: 2,300 pages at 5% coverage, Premium version. Compatible black laser toner cartridge for HP printers, yield: 2,000 pages at 5% coverage, Supreme version. Compatible black laser toner cartridge for HP printers, yield: 2,500 pages at 5% coverage, Supreme version. 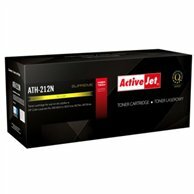 ActiveJet ATH-212N replacement for HP 131A CF212A Toner replacement in yellow dedicated to the HP Color LaserJet Pro 200 M251n, M251nw, M276n, M276nw / Canon i-SENSYS LBP7100Cn, LPB7110Cw, MF8230Cn, MF8280Cw, with a capacity of 1,800 pages.